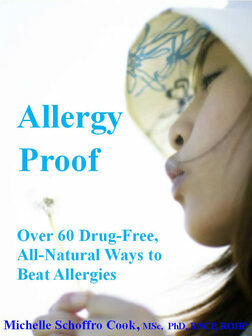 Allergy-Proof: Over 60 Drug-Free, All-Natural Ways to Beat Allergies is your one-stop resource for over 60 natural solutions to seasonal allergies. Learn about the strategies, easy dietary changes and natural, drug-free medicines that eliminate sneezing, congestion, itchy eyes and more. Allergy-Proof offers both symptom relief and guidance to re-build your body’s resistance to allergens. -4 Therapies to Ease Allergy Suffering.